Rare Italian copper jar from the late 18th beginning of the 19th, lower part with applications of copper medallions with lion face of four different expressions, the top with a woman's face and shells on the handle and peak of the jar. Missing a medallion, in general good condition. 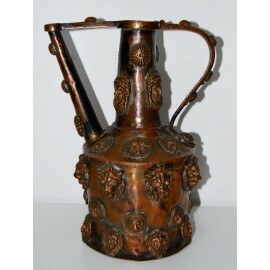 Antique rare Italian copper jar from the late eighteenth century beginning of the nineteenth century, lower part with applications of copper medallions with lion face of four different expressions, the top with a woman's face and shells on the handle and peak of the jar.